LAS VEGAS, NV	& SECOND LIFE	- 08 Jan 2007: At the Consumer Electronics Show today, Sears and IBM (NYSE: IBM) unveiled a prototype 3-D showroom called the "Sears Virtual Home," which resides on an IBM "island" in the virtual world of Second Life. Sears' early prototype store is meant as a showcase of basic features of what might be possible in using virtual worlds to transform consumer experiences. The initial store allows consumers to experiment with changing the color of the cabinets and countertops in a virtual kitchen, explore 3-D versions of various home theater set-ups and learn how to organize their garage by virtually customizing storage accessories. Eventually, it is anticipated that Sears' customers will be able to use "avatars" -- 3-D virtual representations of themselves -- to replicate their exact room dimensions and experiment with redesigning their kitchen, garage or home theater by selecting appliances, tools and furniture that fit those blueprints, using the immersive, 3-D environment. Consumers would be able to instantly change the colors, sizes and styles of refrigerators, ovens, counter tops, cabinets, televisions and more. resides on an IBM "island" in the virtual world of Second Life. their garage by virtually customizing storage accessories. "Sears is committed to providing our customers with the best possible shopping experience and to looking for new and exciting ways to present our products and services," said Paul Miller, senior vice president, Direct Commerce, Sears Holdings. "The Sears Virtual Home combines the best of virtual worlds and 3-D environments so customers can experience Sears' products in a way that is closer to real life. Sears.com already provides innovative design functionality and this work with IBM in a virtual world is a logical extension of those initiatives." The virtual showroom replicates in 3-D the custom design tools available today on the Web at Sears.com. Consumers can order items from the "Sears Virtual Home" by connecting from the 3-D environment to Sears.com and choosing delivery to their homes or the option to pick up the items in their local Sears store. 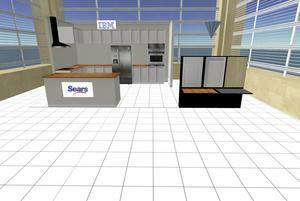 IBM and Sears will be exploring additional ways to link the real world with the virtual world. For example, customers visiting the Sears Virtual Home can have their friends, family members or personal designers join them "in world" and give their personal advice on choosing the right products to build their dream room. "Our goal is to help Sears use these 3-D virtual worlds to transform how people shop, from simple appliance purchases to total kitchen makeovers. Customers would be able to test drive their entire dream kitchen in a 3-D virtual environment before it is actually built, which provides a powerful new tool to drive customer satisfaction and sales," said Sandra Kearney, director of virtual worlds and 3-D Internet, IBM. These experimentations -- with innovative companies like Sears and Circuit City -- are part of an IBM-led initiative to collaborate with clients and partners on both conducting business inside virtual worlds and connecting the virtual world with the real world to create a richer, more immersive Web environment, and to solve business problems in a new way. IBM has a series of areas in Second Life open to the general public. On these "islands" -- which are spaces where people can build three-dimensional objects and interact with other people in a way that is more like real life than a web conference or phone call -- IBM has been experimenting on extending virtual worlds for business in three key areas: virtual commerce and work with clients to apply virtual worlds to business problems; driving new kinds of collaboration and education; and experimentations on pushing the limits with a broad community on what might be possible in virtual worlds. "We view these virtual worlds at a very early stage, both technically and culturally. The user experience will improve as we do more experimentation and figure out how to better apply them to solve real problems in business and society," said Irving Wladawsky-Berger, IBM's chief technologist. "Commerce and collaboration are two key areas ripe for applying virtual worlds to real life, but we also see applications in education, healthcare and many other areas." IBM is working with dozens of clients to experiment and help them understand and apply virtual worlds to their business. While IBM is prototyping and developing in Second Life, it has a bigger strategy to collaborate with a community in an open source fashion to build out the next generation Web, which IBM calls the 3-D Internet. IBM also aims to build a platform for internal use, including 3-D Intranets inside of a company firewall where private and confidential business can be conducted.